Wanting to learn and share more about local trailblazers in their own field, the members of the Women in Architecture Committee of the Wanting to learn and share more about local trailblazers in their own field, the members of the Women in Architecture Committee of the American Institute of Architects (AIA) Baltimore Chapter have launched an extensively detailed exhibit entitled “Early Women of Architecture in Maryland” which is on display downtown at the central branch of the Enoch Pratt Free Library until January 16. 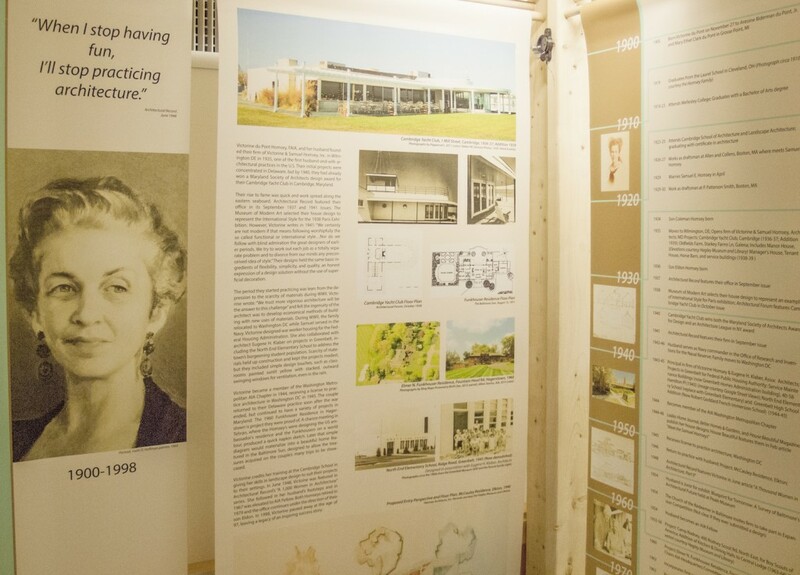 The exhibit features 12 innovative women who did architectural work in Maryland from the 1920s through the 1960s. They include Rose Isabel Greely (the first licensed female architect in Washington, DC) and Katherine Cutler Ficken (the first licensed female architect in Maryland) as well as two women architects who are alive today; Helen Ross Staley (94 years old) and Shirley Kerr Kennard (87 years old). 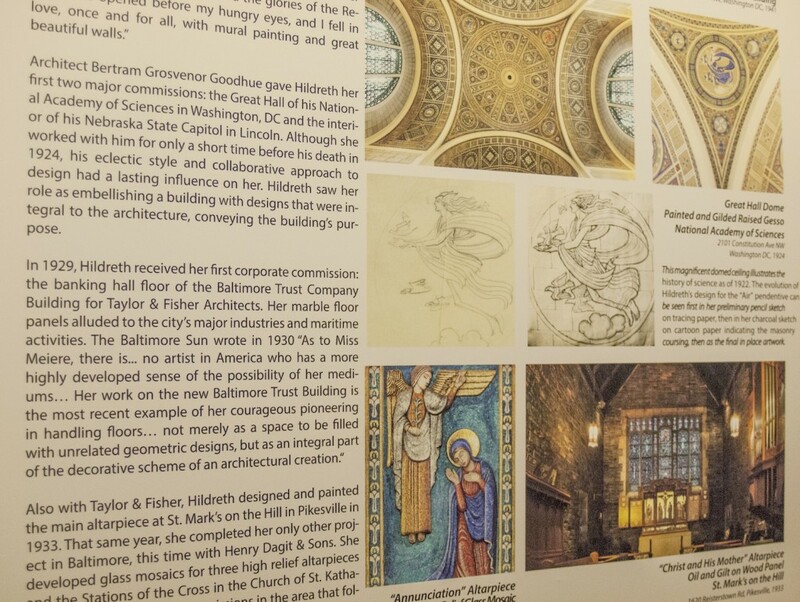 As I walked through the exhibit with curator Jillian Storms, AIA (the Chair of the Committee), two visitors recognized her from the “Exhibit Acknowledgements” panel, and asked her more about her background in architecture. She has over 30 years experience as a professional architect and currently works in the School Facilities Branch of the Maryland State Department of Education, which has familiarized her with many of the communities in which these women designed their work. 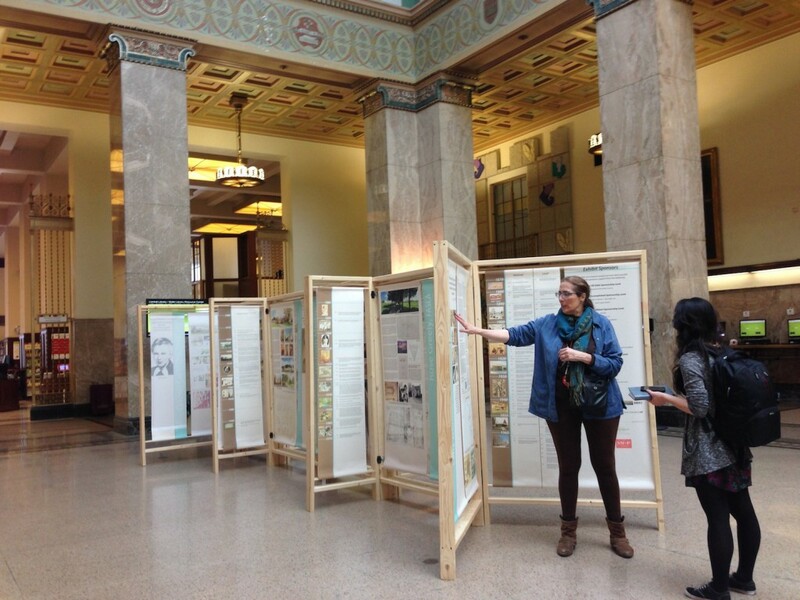 Featured in the exhibit are projects in Baltimore City and 14 Maryland counties. “We just really felt that it was important to capture these stories, before they disappeared, even when finding information proved very difficult,” says Storms. 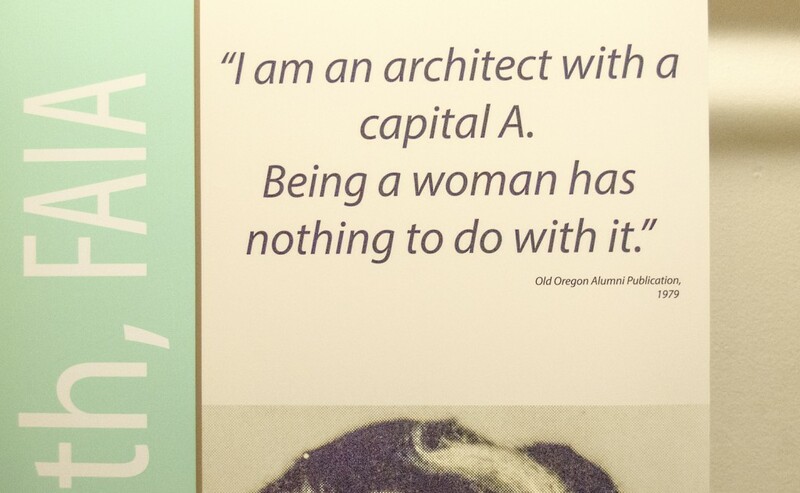 “You see how history sort of evaporates—and then it’s like it doesn’t exist.” The committee started this ambitious project almost 2 years ago during Women’s History Month in March 2013, when Storms realized that little was known about the early women architects in the state. The Women in Architecture Committee applied for a grant from the Maryland Humanities Council through the Baltimore Architecture Foundation and began an independent research study with Morgan State University’s Honors Program in association with the School of Architecture & Planning. 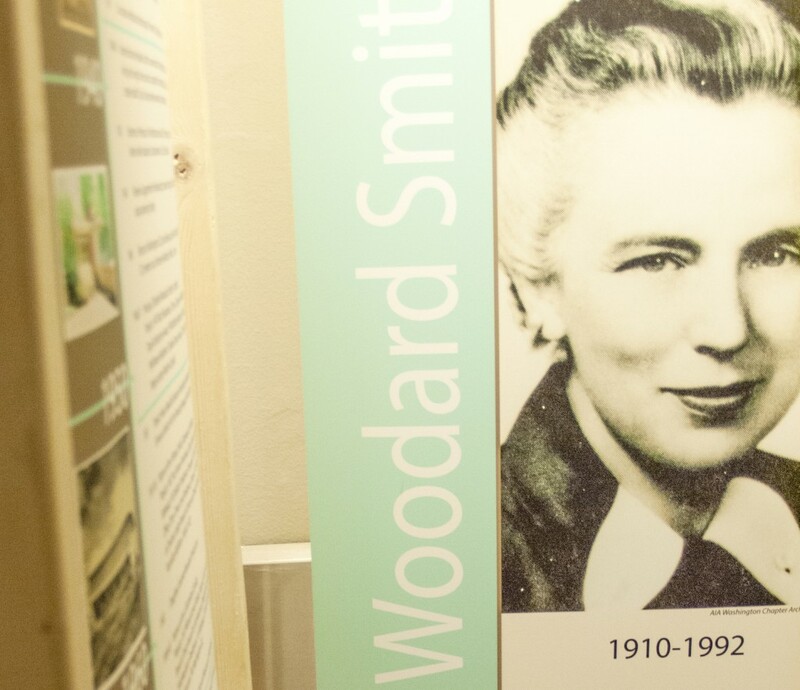 Though not all the featured women hail from the Free State – some lived in Washington, Delaware, and even New York – the exhibit focuses on the work they did in Maryland. The earliest of these pioneers was Greely, a landscape architect born in 1887. She studied at the Cambridge School of Domestic and Landscape Architecture for Women in Massachusetts (which would become part of Smith College in 1938. It became known for championing Modernist design; although the Cambridge School program closed in 1942, due to financial difficulties, that was the same year that women were first admitted into the Harvard Graduate School of Design). 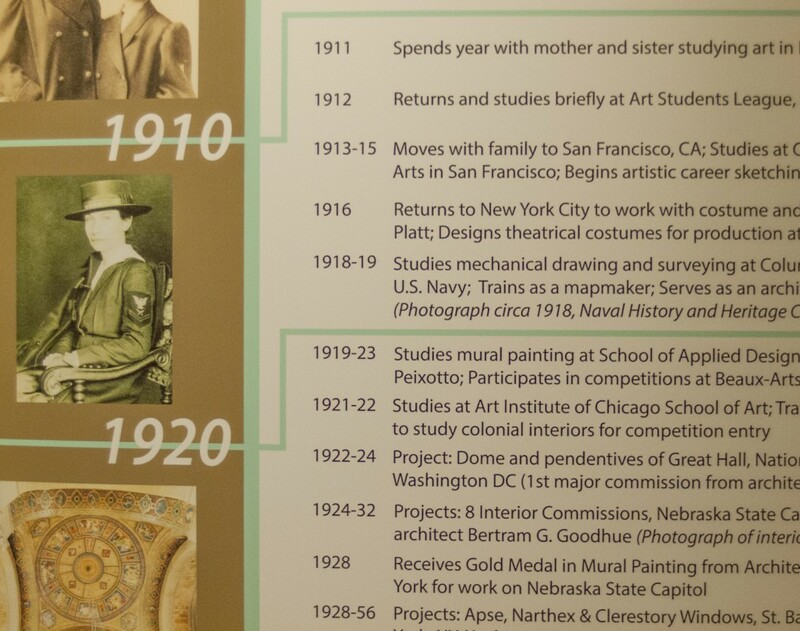 In 1925, Greely became the first woman licensed to practice architecture in Washington, DC. She primarily designed gardens and landscapes, for which she was elected to the College of Fellows of the American Society of Landscape Architects (FASLA). A year later she started her own firm and was able to continue working throughout the Great Depression due to her social standing, which provided her with “connections to Washington’s elite.” Hearing this story, it’s easy to assume that the other featured architects would have similar socio-economic backgrounds, but that’s not the case. Gertrude Sawyer, who Storms calls one of her “favorites,” had no such luck— born in Illinois farmlands in 1895, without any upper-class connections to provide her client base. Impressed by her perseverance, Storms notes, “She’s a woman who did not have ties. It’s not like she came from high society in Washington or knew all these wealthy people. 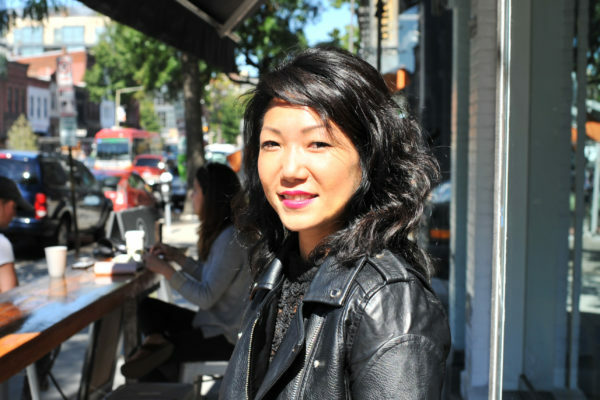 She got these jobs because of her skill.” As Jillian Storms walks through the exhibit, she speaks as if she knows the 12 women personally, recalling anecdotes of their lives not even listed on the informational panels. 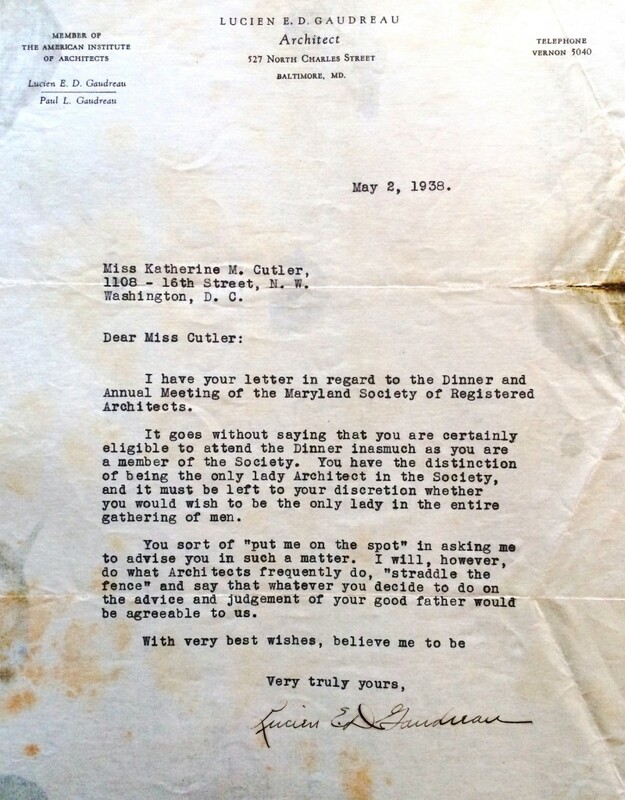 When passing the biography on Chloethiel Woodard Smith, a well-known Washington, DC architect (who was one of the first woman to be elevated to the AIA College of Fellows in 1960), Storms comments on the familiar challenge of work/family conflicts that these women faced. 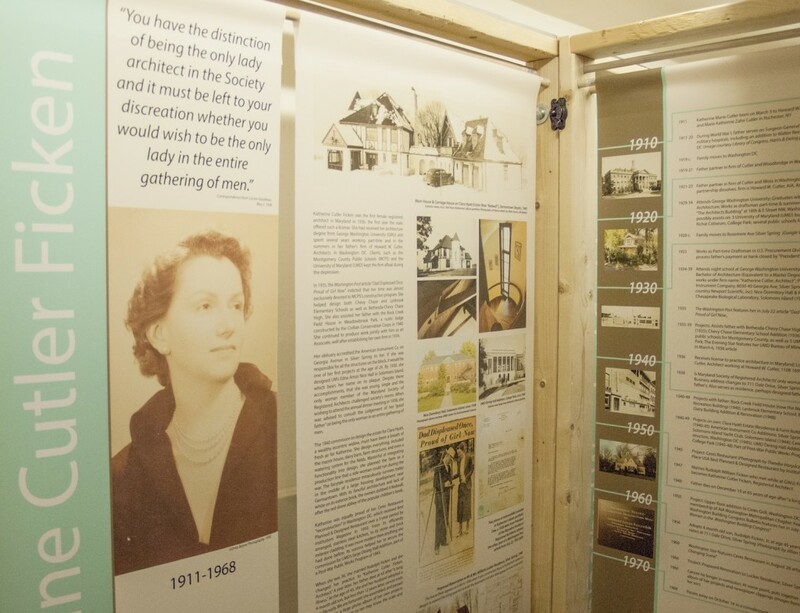 This connection to the women makes sense, given the depth of the initiative; this exhibit is the first project to detail the early women of architecture in Maryland, so the research team did a tremendous amount of work from scratch. The research team included Storms, Sadie Dempsey (who designed and built the exhibit display), Emily Khalid, Kristie Person, Geraldine Pontius, Bev Eisenberg, Anne Bruder and MSU students Thania Villalobos and Doug Butari. Starting with a list of architects from the national AIA organization, they began digging into the backstories of the earliest women they found; searching through old newspapers, speaking with local historical societies, interviewing those still alive, tracking down relatives, and even using the Google Maps’ street view function to search for buildings in the women’s signature styles. 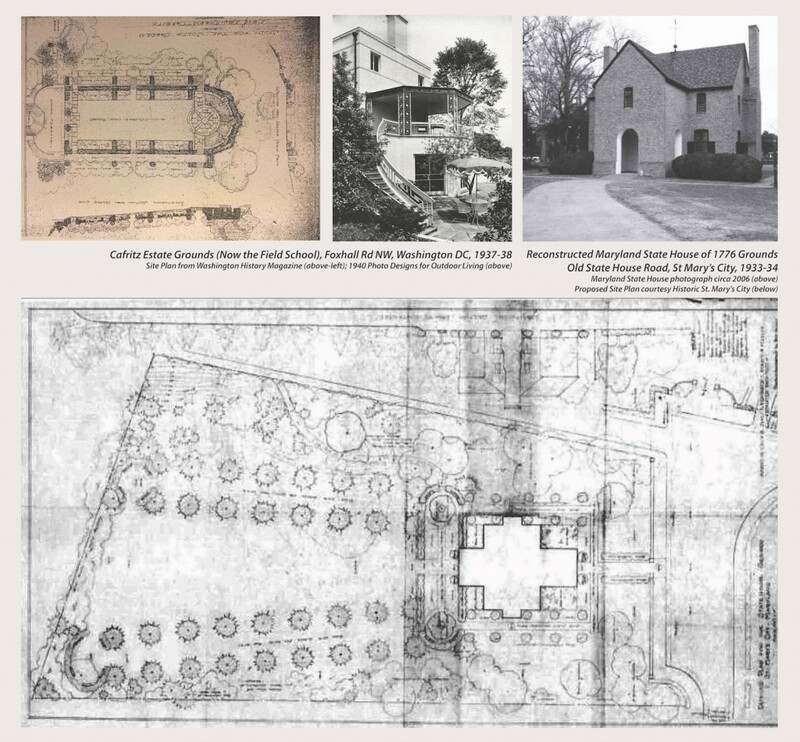 Katherine Cutler Ficken was the first female architect registered in Maryland, and her story is one of the most striking. One of her clients was the University of Maryland, yet despite her clearly established capabilities and credentials, being a woman presented significant challenges in her professional life. 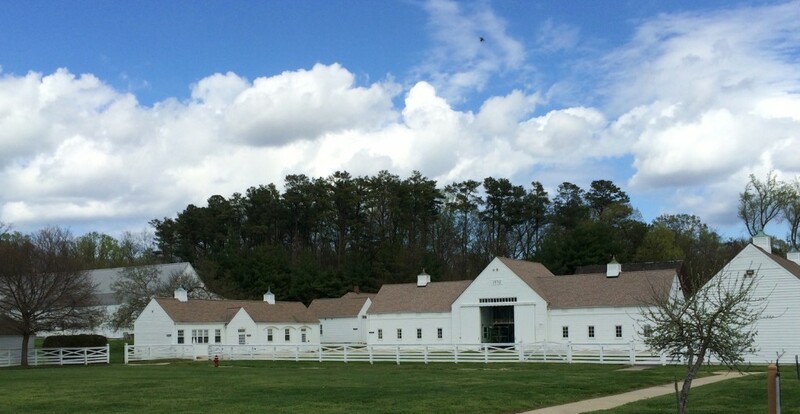 When she asked to attend a dinner and annual meeting hosted by the Maryland Society of Registered Architects, she received a letter from the organization’s president, still on the fence about whether to accept her request. While he acknowledged that her eligibility “goes without saying,” he worried about her being “the only lady in the entire gathering of men.” He concluded, “Whatever you decide to do on the advice and judgment of your good father would be agreeable to us.” In addition to focusing on the women’s portfolios and styles, learning even more about this social dimension will help viewers understand more about what it was like to be a woman working in the early 1900s. Curator Jillian Storms will lead a Free Exhibit Tour at Central Pratt Library downtown on Saturday, January 9, 2016 at 1:30 pm. 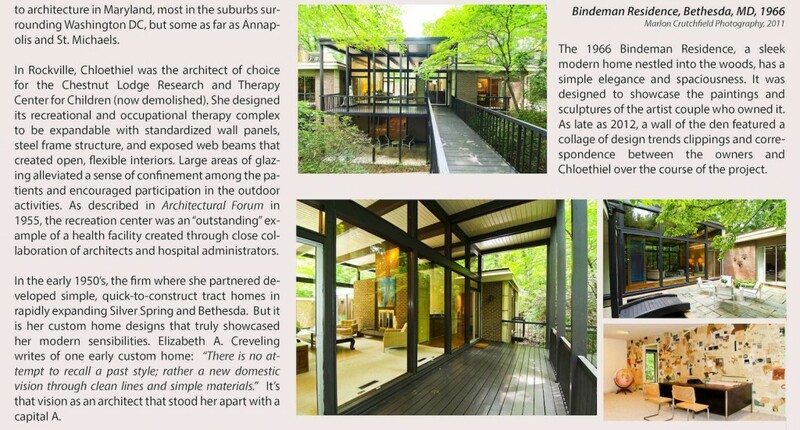 For 2016, the exhibit is scheduled for installation at the University of Maryland School of Architecture (Kibel Gallery) in February, with a Panel Presentation on Wednesday, February 10th from 5 – 6:30 pm, on “Women Architects’ contribution to Mid-Century Modernism in Maryland,” focusing on six of the architects in the exhibit and including new discoveries since the exhibit was put together.